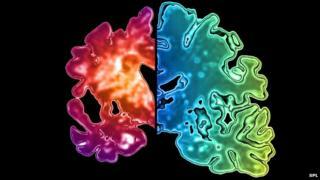 A prevention strategy for Alzheimer's using light to stimulate brainwaves is being investigated by scientists. Strathclyde University's 14-month study will assess whether the build-up of the protein beta-amyloid can be halted in a range of areas of the brain. Alzheimer's is said to be caused when this protein accumulates in the brain. Previous research has suggested using light to manipulate the activity of neurons can reduce the protein in some regions of the brain. This study will attempt to find out if the method can be used to do this across many brain regions at the same time. Dr Shuzo Sakata, who is leading the study, said: "We are hopeful that this research can contribute to a new strategy for stopping Alzheimer's developing, particularly in people who, owing to family history or genetic issues, are seen to be at high risk of the disease." About 500,000 people in the UK have Alzheimer's but currently there are no effective treatments or a cure. The pre-clinical research will focus on a brain area which communicates with many other areas and is among those most affected by Alzheimer's. The research has received a grant of £50,000 from Alzheimer's Research UK. Dr Carol Routledge, the charity's director of research, said: "Dementia is one of our greatest medical challenges, but research has the power to improve our understanding of the condition and deliver effective new treatments."